More Information on the Protest at the U.N.
British Museum Lecture: "Babylonian Work Ethics"
I was working at my desk one day when my friend and coworker turned to me and said, “I just don’t get how you can be so attached or involved with elections taking place in a country that you haven’t grown up in.” Of course, she is asking about the Iraqi elections. She obviously was not saying this to be rude, but she was genuinely interested because she knew how dedicated and passionate I was for the Assyrian and Iraqi cause. Plus, she’d been hearing about it day in and day out for a year! Since then, I’ve really dug deep to find an answer to her question. Why should I care about what is going on in a country so foreign, so far away? How is it that a girl that has grown up with soccer games, a liberal arts education and the American dream feel so much for a country so torn, so distant? Was it because I was born there? Perhaps. Could it be because I’m the daughter of an Assyrian nationalist who has dedicated most of his life for the unity and advancement of the Assyrian people? Perhaps. Is it because I’ve been fortunate enough to be brought up in a nationalistic home where I was never able to forget where and what I came from? Perhaps. Is it because I’m a bright-eyed, educated “liberal” who strives for democracy, equality, justice and peace in this world? Perhaps. The past month has opened my eyes and heart to the reality of my people. Until recently, I’ve thought, hey, we’ve been around for over 7000 years. What’s another 1000 more? Surely, God will save us and keep us as he has done before. Assyrian, Chaldean, Chaldo-Ashur, Ashur-Chaldo? What does it matter? We will still be around, right? Of course, no one knows our destiny as a people. I sometimes wonder if God is testing us or our survival. Why is it that we are still around without a state to call our own? Where are we heading? What am I going to tell my children and their children about the land of their ancestors? I want to share with you my recent voting experience in the Iraqi elections. This is a bit of a delayed response for several reasons. I wanted to collect my thoughts, calm my emotions, and really put into perspective for the Zinda reader, what it was like being a zeroth-generation Assyrian Iraqi-American voting in the Iraqi election. In addition, I did not in any way want to come off as “Iraqi-centric.” I am first and foremost an Assyrian and am fully aware that Assyria extends beyond the boundaries of Iraq. For weeks before the election, I was honestly having doubts about driving down to Irvine [in Southern California] twice—once to vote, once to register. I was bitter about not having election stations in the Bay Area, and kept asking why the Assyrian community did not lobby to get an election station in the Bay Area. The Kurds got two in Nashville---yes, Nashville (my coworkers got a kick out of that). I got over it, found a friend to drive down with and just went down there. I knew I had to. The drive down was relatively uneventful. Between the hours of chatting with my friend, I would look outside and see green fields and agriculture and ask myself, what does Atra look like? How do they do things back in the Homeland? Is it really as beautiful as my parents told my brother and me for years and years growing up? I wondered what the voting stations in Atra look like. These thoughts stayed with me all day. We arrived at the station an hour before it closed, registered and were out the door in five minutes. Wow, we just drove seven hours for 5 minutes of registration. Was it really worth the drive? You bet it was, and I didn’t realize the importance of it until I went back again the next week. Leaving the Bay Area before sunrise the following week, my friend, her family and I drove down to Irvine. I was so excited to go cast my vote. First ever “democratic” (yes, I know it was not perfect, but just go along with me here) elections in Iraq. I thought back to November when I cast my vote in the American elections as a proud citizen of the society that has become my home. As an advocate for democratic society (regardless of the form), I was so excited to think that Iraq can perhaps one day become a truly democratic state. The Iraqi election was an entirely different experience, one of mixed emotions and an even stronger feeling of obligation and importance. Miles and miles went by and we finally arrived, parked next to some other dedicated Bay Area Assyrians, and walked up to the voting stations. We passed by a few Assyrian, and many Iraqi and Kurdish, flags and so many people that despite their religious and ethnic division unknowingly and silently screamed “I am Iraqi.” I felt the energy and the enthusiasm. I felt the optimism for a better Iraq--an unoccupied, secular, democratic Iraq where a land so rich could be shared by so many. I felt years of suffering of the Iraqi people, Assyrian and non-Assyrian alike. My heart was racing with excitement. Just then, a local Bay Area historian, nationalist and friend said to me, “You know it is really discriminatory that they didn’t put a voting station in the Bay Area and other places with an Assyrian stronghold.” He said that this was worth protesting. I thought about it for a while, my eyes filled up with tears, and my body started shaking. I was just so tired and so overwhelmed with emotion, I replied to him. I said, “Look around you. Where are our people? Look at Chicago, home to at least 40000+ eligible Iraqi Assyrians where numbers just shy of 7000 registered, including other Iraqis. Where are our numbers? How can I protest? On what basis? 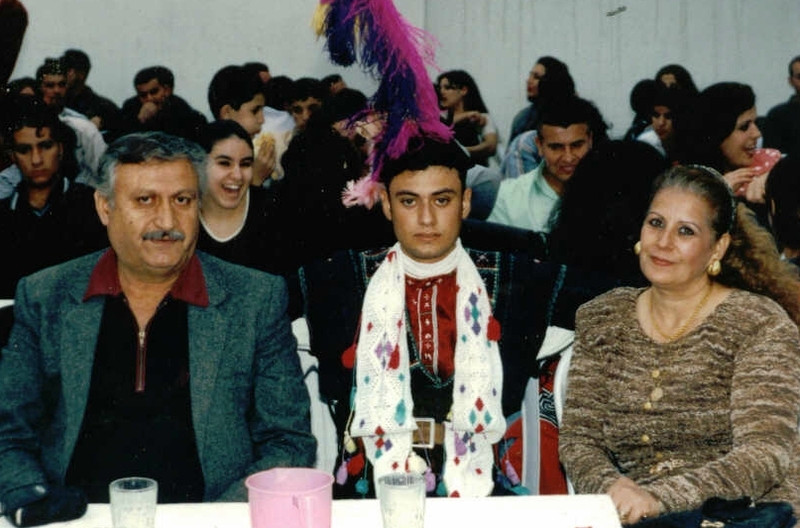 If a Kurd, who keeps alive within him the dream of a Kurdistan, can drive from Texas to Nashville to register and then again to vote, why can’t the Assyrians? If another Iraqi family drove from Seattle to Irvine twice in two weeks, why can’t our Assyrians?” A solemn look came over his face and he just said, “You are right.” At that point, I broke down with emotion and I just cried and cried. It was at that moment that I realized severity of the situation and future for Assyrians in Iraq. It was then I realized that I do keep alive in my heart, soul and mind the dream of Assyria, the promise of better days for all of Iraq’s people, and one day returning to my ancestral land where by the grace of God I was brought into this world. As I cast my vote that day, I thought about my parents that left a land so familiar in promise of safe and brighter days for their children. I thought about my father so desperate to return to his homeland. I thought about the aunt, uncle, and cousins that stay in my grandparents’ home in Baghdad that I have yet to meet. I thought about the hundreds of church goers in Iraq whose religious and cultural devotion does not fade despite of the attacks on our churches. I thought of the man that guards the 1600-year-old church in Baghdeda and his family that doesn’t know if he will make it home that night. I thought about the armed men of Zowaa that risk their lives to protect the Assyrian (or ChaldoAssyrian) name and compounds. I thought about the young couple that died during a malicious attack on one of our churches while handing out invitations to what would have been the happiest day of their lives. I thought about the distress in the eyes of so many pictured in Zinda magazine. I thought about how fortunate I was to have grown up in a land with no sanctions and with extreme surplus of food, money, and good times. I thought about so many Iraqi children that died under the inhumane sanctions. I thought about the suffering of all Iraqis, including my own Assyrian people. The vote wasn’t just for me. The vote wasn’t for me to dance up and down and claim I’m Iraqi for one day. My vote was for all these people and for the many more which go unnamed. While I do believe there was a more than obvious choice for our people (and this is pretty obvious if you think about those that have stayed in Iraq all these years and are familiar with the local governments), more important was that we had people voting—regardless of the party number. The symbolism behind this vote had just as much importance. I knew that I was sending a message to all of Iraq, saying yes, we may be away from our homeland, but we still care! We are Iraqis nevertheless! Closer to my heart, I sent a message home to all those Assyrians that so desperately wanted to vote but couldn’t due to fear, unsafe conditions, and other reasons (including the silencing and blocking of their inherent right to vote by local governments!). So ask me now, was it worth it? It was that day that I realized that you don’t have to be the son or daughter of a nationalist or be fortunate enough to attend top-ranking academic institutions to be socially responsible, to be dedicated to your people, to remember your roots, and to care for those that have died to save your name and retain your cultural and religious traditions. It is more than an obligation to the Assyrian people; it is a duty that lies within the spirit and blood of each and every one of us that is a testament to our survival and our strength. We all share a responsibility for the current situation of our people. I do, however, choose to stay optimistic. I believe that we are truly more capable nationalists than displayed by our annual social conventions, ever so frequent dance parties, and feuding political parties. Despite the poor voter turnout in this election, I refuse to believe we are a nation of ungrateful complainers and apathetic people. I believe in my fellow zeroth- and first-generation Assyrian Americans. Despite a society so quick to assimilate and often driven by the pressures of capitalism and money, I believe that we do have the drive and power to unify our people and increase the visibility of Assyrians in the United States and abroad. We are a bright, optimistic, and educated group of individuals with creative ideas. Now is the time when we must unite—as Assyrians (Chaldeans, Syriac-speaking people), Christians, and descendants of a land so rich in culture, language, religion, and history. Call me a naïve, inexperienced girl if you choose, but I, like others, will not give up. Yes, chances are I will never see an Assyria in my lifetime, but I know the dream must never die. Assyrian nationalists and Christians will agree that Assyria will rise again, whether as a state or simply as vocal, represented and recognized people. Let us stop dwelling on the past and push ahead. Be proud of the generations before you and move into tomorrow with the hope that you can effect change. Own up to responsibility and failures as a community. Work towards insuring and preserving the cultural and religious rights of your people in the Middle East who despite war and tragedy preserve our visibility and presence in the Homeland. We have no choice but to keep the dream alive. God has tested our strength and survival for thousands of years. How many more times will we be called upon to unite before we end up as dispersed people of a great empire that once was? 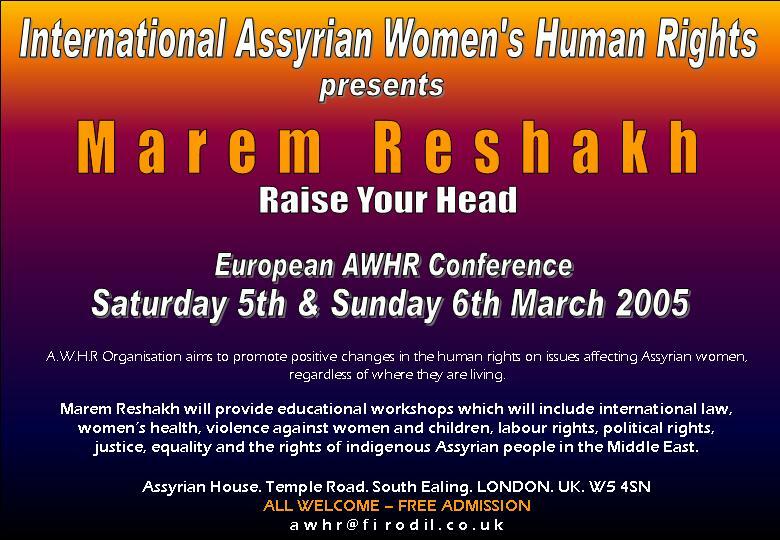 Think about it and ask yourself: What are you doing to keep alive the Assyrian dream? 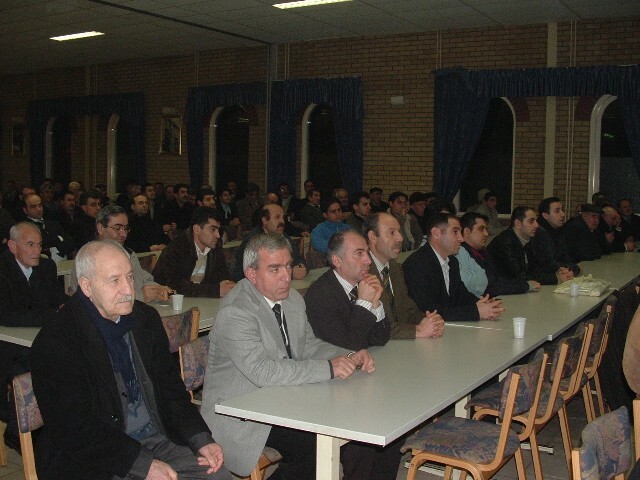 (ZNDA: Enschede) Nearly 500 Suryoye-Assyrians attended a lecture on the Seyfo Genocide on Sunday 20 February at the Mor Kuryakos Church in Enschede, Netherlands. This historical lecture was an initiative of St. Kuryakos Church committee. The honorary guest speakers were: His Eminence Mor Yulius Y. Çiçek, Archbishop of Central Europe and Mr. Sabri Atman, a renowned Assyrian Seyfo scholar. H.E. Mor Yulius Çiçek, reading from a book during his lecture. Mr. Atman, looking up, spoke next on the historic attributes of the Seyfo Genocide. The lecture commenced with H.E. Mor Yulius Y. Çiçek addressing the sheer suffering of the Assyrian people since the advent of Islam. His Eminence linked the current suffering and the Diaspora with the massacres of 1895 and the Genocide of 1915 (Seyfo or "the Sword"). He reiterated that Germany and Austria were also liable for the genocide of the Assyrians, Armenians and Greeks hence they must rise to the occasion and advocate the recognition of Seyfo. H.E. 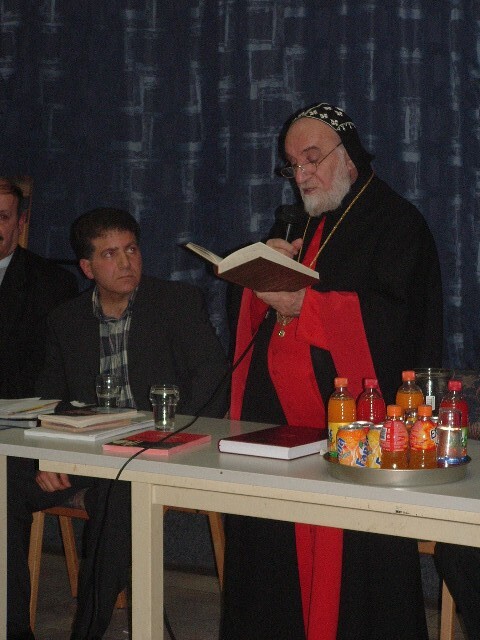 Mor Yulius Y. Çiçek said that most Assyrians received their information from the melancholy tales of their elders, but he emphatically expressed the need for scholarly research to academically elevate the issue of Seyfo. He said that the Monastery of Mor Ephrem in Holland has published numerous books on this subject, and he encouraged the audience to read them. He concluded his speech with the following comments prior to introducing Mr. Atman to the fore: “I am very pleased with Mr. Sabri Atman for his work concerning the Seyfo”. Mr. Atman asked all those present to stand up for a minute of silence to commemorate the souls of all the Assyrian, Armenian and Greek victims of the Genocide. It felt as if a dark cloud of a consciously suppressed collective memory covered over the people as the room fell to an utter silence. • The role of Islam, Kurds and Germany. • The role of the international community, which continues to overlook this horrendous crime. • Why the Armenian genocide is sited more than that of the Assyrians (Suryoye). • Turkey’s continuous denial of the genocide. • Why Turkey must recognize Seyfo. To commemorate the 90th memorial of the genocide, Assyrian organisations from around the globe are organising worldwide activities, and Mr. Atman ended his speech with an invitation for H.E. Mor Yulius Y. Çiçek to participate in one of these demonstrations which will be held in Brussels next month. His H.E. Mor Yulius Y. Çiçek confirmed his acceptance and promised to support all the activities for the Seyfo. “It is just not enough to talk about the importance of Seyfo... it is now time to act on it. We must fulfil our duties as Assyrians and participate in the coming activities on Seyfo for recognizing the Assyrian Genocide”, said Mr. Atman. (ZNDA: New York) The Assyrians on the East Coast of the United States expressed their protest at the disenfranchisement of their co-ethnics through a demonstration held at the United Nations building last week. In the first relatively free Iraqi elections, the Assyrians on the Nineveh Plains lost their chance to be counted. The demonstration held on Saturday, 19 February may well have been the first Assyrian demonstration ever held in New York in the recent time. Nearly 100 persons, mostly young people, chanted, sang and prayed in Syriac for two hours behind a police barricade. They carried large banner signs in the Assyrian neo-Aramaic, in English and in Chinese all of which addressed the problem of the six towns east of Mosul which did not receive ballots despite two days (Jan 30 and 31) of waiting to vote. These are the same towns in which the candidates on list 204 had campaigned for three days and hundreds of thousands of votes for ChaldoAssyrian representation would have been cast had the people not been prevented from voting. As it was, because the voting did not take place, only enough votes were counted to seat one independent ChaldoAssyrian representative. 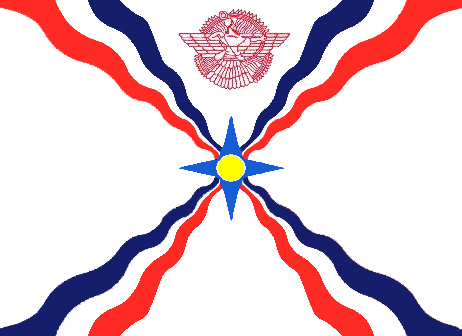 Four other ChaldoAssyrians came in under the auspices of the leading Kurdish list and one, from Baghdad, gained a seat under the Allawi list. The demonstrators at UN Plaza, many from Massachusetts and Connecticut who had rented a bus for the trip, joined others from Long Island, Manhattan and New Jersey to make their voices heard on a very cold New York day chilled further by proximity to the East River. Passing cars and foot traffic noted especially the sign in Chinese which said " 1400 American soldiers died in Iraq, but Assyrian Christians still could not vote." The Assyrians were joined by a group of Turkomens from the New York area, including a musician who is a Turkomen Christian from the Kirmizi Kelise community of Kirkuk, which is known as Qal'a Gawur. Turkomens also joined the protest in Chicago on February 13. Next day at a meeting of the Executive Board or Seeta, the administrative committee of the Assyrian Church of the East in Linköping, the priest the same question. Members of the committee's answer varied from 400 to 600. All guess work. The young priest, Rev. 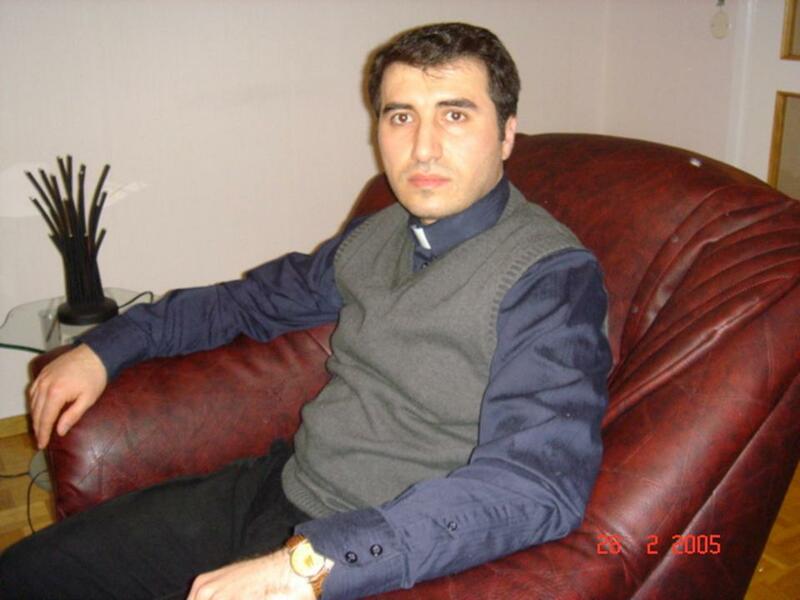 Aprim Moshe Iskhaq, was ordained on 27 November 2004 by Metropolitan Mar Avrahim Odishu, to minister in the city of Linköping, Sweden for the Assyrian community upon the request of the community members. Rev. Aprim was born in Duhok, Iraq, on 20 April 1974. His first act was to find out the number of the members of the Assyrian Church of the East in Linköping. He designed a form of questionnaire in Arabic and Swedish. The form was distributed to all those attending the Christmas Eve celebrations on 25 December 2004. On that date after church services 150 forms were picked up by the members of the congregation and 140 completed forms have since been returned to the Administrative Committee. Rev. Aprim Moshe Iskhaq ministers in the Assyrian Church of the East in Linköping, Sweden. 8) Swedish citizen? Permanent resident? Other? The Administrative Committee is now planning to prepare an account of the members of the Church. Since most Assyrian families live together with their parents, Seeta plans to record family members from their parents. Another project underway is the preparation and distribution of another form asking members of the Church where their parents and forefathers who had passed away were buried. This, Rev. Aprim , considers as very important to maintain the memory of their deceased parents and to keep a link with the past. Rev. Aprim is also planning to prepare a telephone directory of all Assyrians in Linköping. The Seeta hopes to include all Assyrians in Sweden in the telephone directory. Teaching of the Assyrian language is also given high priority. Shortly Assyrian language classes will begin. Assyrian students in Sweden studying their mother language are graded and their scores are added to their grades in the Swedish public schools. Shortly Rev. Aprim will attend Swedish and English languages and plans to study Theology at a Swedish University. Pityo Shimon Pityo, Chief Engineer for Baghdad Airport, was assassinated by a group of criminals that want to bring back the dictatorship and the Baath party. On the morning of Thursday, February 24, 2005, as Mr. Pityo was on his way to work, a cowardly gang of criminals intercepted his vehicle and shot him multiple times. Mr. Pityo was born in 1946 and earned his Engineering Diploma in the United States in 1977. Upon his graduation he returned to Iraq and worked for the Iraqi Airlines. After the fall of Saddam and despite the lack of security Mr. Pityo continued to work at the airport, brushing aside his family’s requests to leave. Mr. Pityo leaves behind many friends and family members, including his wife of 27 years, Evon, son Roni, mother Helen, brothers; William, Wilson, and Ashur, sisters; Beronia, Janet, Virginia, and Maria. On Sunday, February 27, a Holy Communion was celebrated in his memory at Saint George Church of the East in Phoenix, Arizona. May God bless his soul. Lecture: " Building Larsa: Mass Labour, Scope-of-Economy, and a Babylonian Rhetoric of Work"
A part of the Topics in Assyriology: Current Research in the British Museum and the London Centre for the Ancient Near East (BANEA South-East) research seminar. Room G51, SOAS, Thornhaugh St WC1. Located strategically on great trade-routes, Iraq was a natural starting point for various missionary expeditions by land and by sea. By the fifth century, a string of dioceses stretched across Iran to Afghanistan and Central Asia where the city of Merv served as the headquarters for missions east of the Oxus River, amongst both Turkic and Iranian peoples. Trade also played an important role in the spread of the Church of the East from southern Iraq down the Gulf to India. testimony of the expanse of Syriac Christianity up to the fourteenth century. communities have now emerged in Europe, England, north America and Australia. Like their venerable counterparts, they are faced with challenges of multi-culturalism, linguistic diffusion and competing religions as well as distance from each other and Iraq. 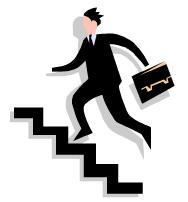 Many of these challenges will take considerable effort to overcome, but the new electronic age provides some solutions. Far-flung congregations are now able to be linked by the internet and e-mail and maintain a new international identity. The morning session will consist of a series of papers exploring the historical spread of the Churches of Iraq up to the fourteenth century. Prof. John Healey (Manchester) Christians in the Gulf in the 7th century A.D.
Mar Aprem (India) The mission of the Church of the East to India. The afternoon session investigates the problems and challenges encountered by the diaspora communities today. The current situation will be discussed by representatives of the various Syriac Churches [the Assyrians, Chaldeans, Syrian Orthodox and Syrian Catholic]. Dr. George Kiraz (Beth Mardutho Institute, USA) will conclude the day talking about "the role of the Beth Mardutho and the global aspects of bringing Syriac studies anywhere, anytime." To register click here to obtain a PDF application form, or visit www.easternchristianity.com. Was It Democratic to Prevent Iraqi Assyrians From Voting? On Election Day, Sunday January 30 th, Iraqis, not only in Iraq, but those living abroad too participated in free elections for the first time in the history of Iraq. As I watched this seemingly democratic process unfold in a country that has suffered from oppression for so long, I was overwhelmed with feelings of joy. But was this really a democratic process? The pictures shown by the media worldwide were those of Iraqis cheering and dancing with wide grins on their faces as they proudly displayed their ink-dyed fingers to the cameras. However, behind this publicized scene there was an untold story that the media opted not to cover. Over 200,000 Assyrian Christians of the Nineveh Plain, along with two other minority groups (Shabak and Yizidees) were prevented from participating in this Democratic process, and were deprived of their right to vote. After being told that they will have polling sites in their villages, these people woke up on Election Day to find their polling centers closed. From the early morning they stood in line waiting and asking for reasons why the polling sites were closed without getting any answers. Throughout the day they were promised that voting ballots and boxes will arrive soon from the city of Mosul all in vain. These people remained in the streets near the polling sites protesting and demanding their right to vote, but their cries were ignored by all those concerned including American forces who were aiding the election process. In addition to these villages, three other towns also inhabited by Assyrian Christians ran out of voting ballots while there were still more people waiting to cast their votes. They too were promised extra ballots which they never received. All of these villages and towns are mostly populated by Assyrian Christians, a minority both ethnically and religiously. No other village, town or city in Iraq was reported to experience the same “technical error”, so was all of this a coincidence? I think not! I believe this was an attempt to diminish the already minimal votes of the Assyrian Christian population, which would ensure that they get no seats (or the least number of seats possible) in the new parliament. However, the Assyrians did not stand by and allow their rights to be stolen again as they have been throughout history. This is the new Iraq, the democratic Iraq, and they were determined to make their voice heard all over the world. Assyrians held peaceful protests in many parts of the world including Stockholm, London, Chicago, Detroit, Toronto, Brussels, and even Baghdad with its security problems. They bravely demanded that their stolen rights be granted back to them, and their demonstrations were the perfect example of a people wanting Democracy. As a result the Independent Electoral Commission of Iraq (IECI) launched an investigation to determine the cause of why the voting ballots and boxes failed to arrive to these locations. The IECI then published a report on its findings. In one part of the report the IEC admitted to reducing the number of polling sites in the Mosul region from 300 to 93! They claimed that this was a security measure that had to be taken. The IECI then ended its report sticking to its claim that this was an error in planning and not intentional. The various Assyrian parties counter-attacked the IECI report by issuing statements of their own. They rejected the IECI claim of security purposes stating that these villages that were prevented from voting were some of the most secure places in Mosul. The Iraqi Organization for Human Rights in the U.S. demanded that the IECI must find a solution to this problem, and stated that the fact that it did not happen anywhere else in Iraq made the incident questionable. 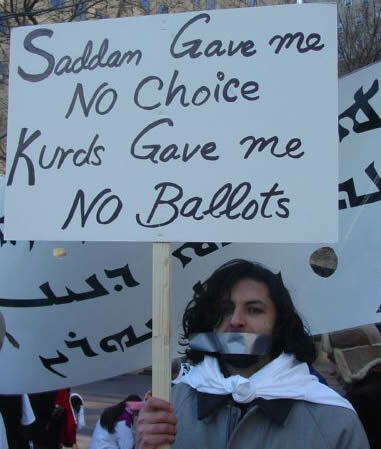 Thus, compared to what Iraqis are used to, these elections were democratic. Nonetheless, certain people and groups were intentionally ignored and excluded from these elections. so, to see whether the elections were a true step towards democracy we will have to wait and see if this reported “mistake” against the Assyrian Christian population of Iraq is mended or just ignored in hopes of being forgotten. Professor Joseph Yacoub, the Assyro-Chaldean intellectual and a long-term resident of France, has been teaching at the Catholic University of Lyon since 1975. He was born in Syria (his parents are from Iran) and has specialized in the study of the minorities, international relations and the Human Rights. He is one of the most prominent spokespersons for the Assyro-Chaldean national cause in France and around the world. Prof. Yacoub is a prolific writer on the subject of the minorities and has has studied hundreds of ethnic and religious groups throughout the world. His book entitled "The Threats on the Iraqi Christians” published by Témoignage Chrétien has met a great success in the bookstores here and has earned Prof. Yacoub the Sélyre Award (Lyon, 2004). After the American invasion of Iraq in 2003, Joseph Yacoub began to wonder about the right of interference, its impact on the sovereignty of nations, and the human rights. His last book, "Are the Uuman Rights Exportable? 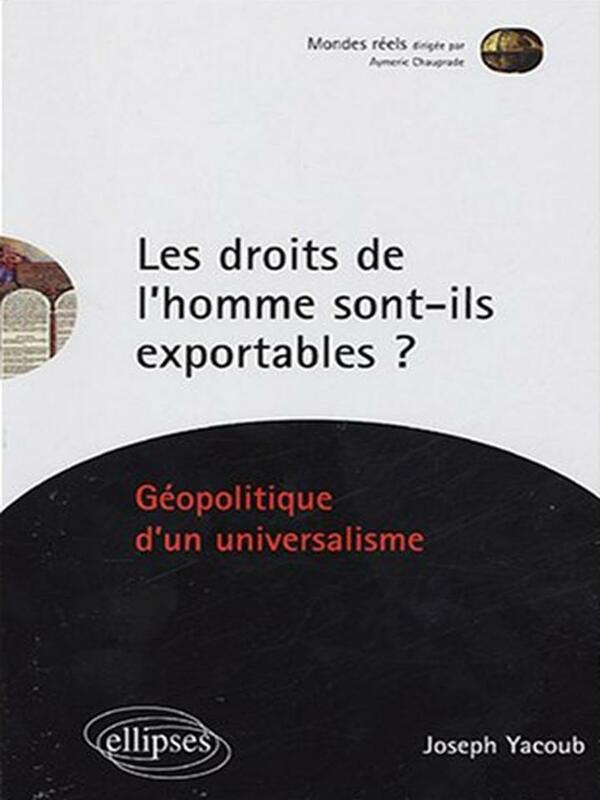 Geopolitics of Universalism", published in a collection of "Mondes Reels" edited by Aymeric Chauprade and publised by Ellipses Publishing House, demonstrates precisely the topicality and the evolution as well as universality of the human rights. After decades of studying the subject, in his recent book Prof. Joseph Yacoub extensively covers the topic of the human rights and in particular that of the 1948 Universal Declaration of the Human Rights. He ask if the Declaration has adapted to the geopolitical conditions of our time? Does it need a recasting? Prof. Yacoub suggests that a revision of the texts and an adaptation to the contemporary world must now be considered. To view the video of the press conference filmed by Samuel Yalap and narrated in Soureth by the author click here. To view the press conference pictures taken by Samuel Yalap, click here. To view the pictures of the conference organized by the Chaldean Mission, taken by Samuel Yalap, click here.